Please visit our other websites for information about Birdscaping (attracting and enjoying birds with our unique feeders and service) for your home/business. Our bird watching/nature tours are great for families who want to see a variety of wildlife along the Paul Bunyan Scenic Byway just north of Brainerd, Minnesota. 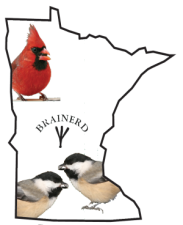 Please visit our local bird reports for Brainerd and Crosslake. These are some bird friendly, B&B’s we highly recommend! Some of our favorite birding resorts. We know you love these spots!